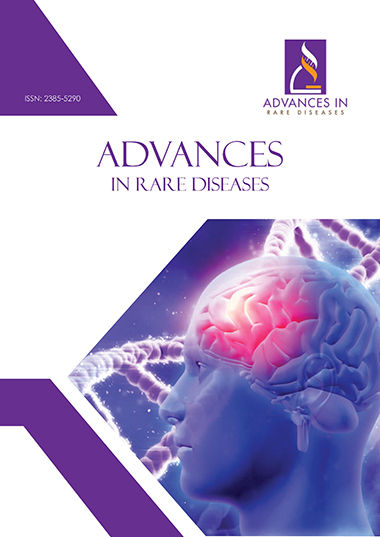 Advances in Rare Diseases is an open access journal that operates with a double-blind peer review policy and publishes articles on recent advances in the understanding of the processes responsible for and associated with rare diseases. The journal was launched in September 2014. Dissemination and implementation of new knowledge on rare diseases will have a significant impact on the improvement of quality of life and the treatment of these diseases. The field of rare disease research includes areas focused on elucidating pathogenic mechanisms associated with rare diseases, clinical trials of novel drugs, and imaging of organs, structures and tumors. It also focuses on the understanding, diagnosis and treatment of genetic disorders. Topics of interest include, but are not limited to genetics, gene expression, epidemiology, screening, diagnosis, prevention, treatment, health economics, regulatory issues and novel clinical findings. All articles published in Advances in Rare Diseases are ‘open access,’ meaning that they are made freely and permanently accessible online immediately upon publication. Authors of articles published in Advances in Rare Diseases are the copyright holders of their articles. However, the ‘open access’ policy implies that authors grant to any third party the right to use, reproduce or disseminate the article, provided that no substantive errors are introduced in the process, proper attribution of authorship and correct citation details are given, and that the bibliographic details are not modified. If the article is reproduced or disseminated in part, it must be clearly indicated. Authors are charged per Original and Review article and per Editorial or Commentary accepted for publication to defray the costs of publication (information is sent with the author’s proof). However, there are no submission charges. Authors are required to make payment only after their manuscript has been accepted for publication. Requests for permission to reproduce figures, tables or portions of articles originally published in Advances in Rare Diseases can be obtained via the Editorial Office. Manuscripts submitted to Advances in Rare Diseases should conform to “Uniform Requirements for Manuscripts Submitted to Biomedical Journals” except if indicated otherwise in the instructions to authors. Manuscripts submitted to Advances in Rare Diseases should not contain material previously published in other publications, except as an abstract, and must not be currently under consideration for publication in another journal. Redundant publication is publication of a paper that overlaps substantially with one already published. When submitting a paper, authors should make a full statement to the editor about all submissions and previous reports that might be regarded as redundant publication of the same or similar work. Advances in Rare Diseases considers research and publication misconduct to be a serious breach of ethics, and will take such actions as necessary to address such misconduct. Authors should refer to the Committee on Publication Ethics (COPE) and the International Committee of Medical Journal Editors for full information. Statements, opinions and results of studies published in Advances in Rare Diseases are those of the authors and do not reflect the policy or position of the journal. Advances in Rare Diseases provides no warranty as to the articles' accuracy or reliability. Advances in Rare Diseases is pleased to announce that it has partnered with the CLOCKSS Archive and LOCKSS program to preserve its content in CLOCKSS's geographically and geopolitically distributed network of redundant archive nodes, located at 12 major research libraries around the world. This action provides for content to be freely available to everyone after a "trigger event" and ensures an author's work will be maximally accessible and useful over time. LOCKSS system has permission to collect, preserve, and serve this Archival Unit. CLOCKSS system has permission to ingest, preserve, and serve this Archival Unit.